The Dragon Age games have been and are many things to me – starting with it (Thedas) being my favourite fictional world. These stories and characters have made my re-think my opinions and have actually influenced my spiritual beliefs. They have made me laugh, cry, feel just about everything that’s possible to feel. They’ve been my escape, and my companionship back when I was too unwell to see real people. A while ago I was gifted an empty little glass bottle, with which I ended up making a little lyrium* potion necklace for myself. I got some nice feedback on it, and thought “hey, if I like this and would pay for this sort of thing, other people might too”. I am learning so much doing this—I have learnt so much about running a business, writing content, and prioritizing my time! And I have learnt many useful things and new skills when it comes to my actual craft work. It’s exciting! I am going to continue to create new things, and explore new skills, and just enjoy the fruits of my labour– Regardless of how much money I end up making from this. 🙂 I believe that if I genuinely enjoy what I’m doing/creating, other people will too. *In terms of game mechanics, lyrium is the Dragon Age equivalent of a generic mana potion. This entry was posted in About Me, My Etsy Story and tagged Crafts, Dragon Age, Etsy, Origins on May 12, 2015 by treedreamer98. This entry was posted in Uncategorized on June 10, 2015 by treedreamer98. Potions Are A Girl’s Best Friend. Photos, Not So Much. Potions, potions, and more potions. I love ’em. Love making ’em. Can’t enough of ’em. They’re 80% of the items in my Etsy shop. Why is it then, that taking decent and accurate photos of my glorious potions is so challenging? Pretty right? But this isn’t realistic– The potion only looks like this when in direct sunlight. Even then the colours aren’t quite right (I had to turn the contrast right down on the camera I was using to get them as close in colour as I could). 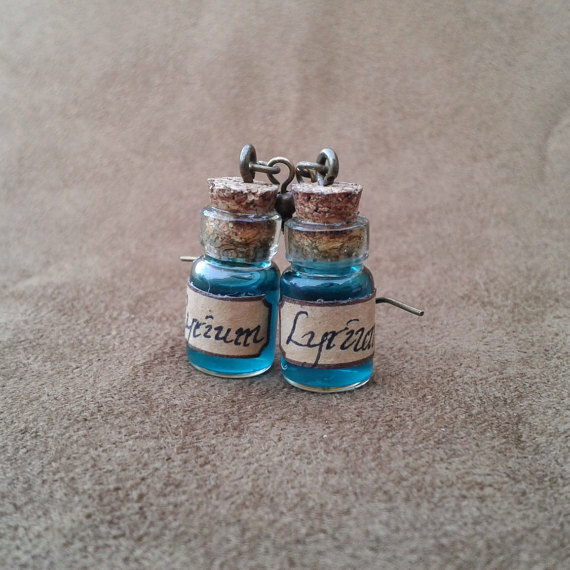 This was my second attempt at photos for my potion earrings. I’m still not overly happy with them (And I forgot to turn down the contrast this time, so that didn’t help). Don’t get me wrong, I think the photos look cool, but they don’t really look that way in-person. This frustrates me. Do you have any advice for me? Any tips/tricks are hugely welcomed! This entry was posted in Etsy, Photography, Problems and tagged Advice needed, Help wanted, Photos, Potions on May 12, 2015 by treedreamer98.